The reemergence in the early eighteenth century of the technology and use of concrete provide the starting point for this first volume of the Treatise on Concrete. In this book are described and analyzed, for the first time, the various contributions that led to the rediscovery of concrete made by the specialists of the period, from chemists to volcanologists; from engineers to architects and construction workers; from inventors to archaeologists and even men of letters. The book traces the various criteria for concrete production using local materials, from hydraulic lime to pozzolana and trass, as well as how the technique of casting concrete in formwork developed from construction-site practices that had survived locally from the times of ancient Rome. The subjects of the book include the transport of Roman pozzolana with which Italian, French, English or Danish engineers built grandiose offshore concrete structures; the genealogy of techniques for manufacturing wood formwork for foundations at sea, in rivers and above ground; the description of the various formwork systems invented to pour concrete in water; the research conducted by chemists on lime and pozzolana that led to the development of concrete; the invention of artificial stone, obtained using various types of cement; and the series of fantastic archaeological findings about the concrete structures of antiquity, which, even if sometimes baseless, nevertheless helped build confidence that this material could be invented. Finally, several great personalities in the history of architecture, such as Piranesi or Soufflot, are presented in a new light and are shown to be vital players in the affirmation of concrete in the eighteenth century. Thus emerges the first entry of a new history of concrete, one that will provide the essential principles needed to understand how the manufacturing methods discovered between the late eighteenth and early nineteenth century emerged and led to the production of this mythical material. 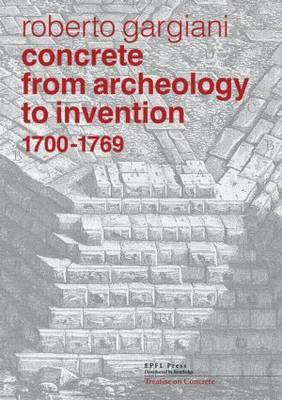 This new history of concrete is clearly of present-day interest, specifically in the context of recent research which aims to encourage concrete production using local materials, including volcanic constituents such as pozzolana - exactly as it was fabricated during the eighteenth century.